Part Two begins, seemingly derivative of Harry Potter. You have a teenager with magical powers, struggling to live a somewhat normal life. 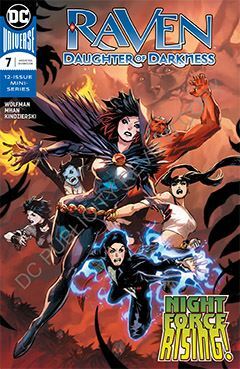 However, netherworldly terrors known as Shadow Hunters hunt and kill magical beings, and have seemingly set their collective sights on him – or her, in this case. Despite the Shadow Hunters attack on Raven’s loved ones, she still resists Baron Winters’ effort to recruit her for his campaign against the Shadow Hunters. He is anticipating a coming battle among the DCU’s mystical beings, but so far the only soldiers he’s managed to entice are teenage girls. As if he wasn’t already creepy enough. Also introduced into the mix is what appears to be a Shadow Hunter in the making – a child born of unholy matrimony, in a perpetual coma yet having developed without the expected medical complications. Judging by the cover, more characters will join the Baron’s army, though none which I recognize. The baron’s efforts may lead to the creation of a new Night Force, which may not be a bad thing, as various DC characters seem to be in the process of being re-allocated. Raven’s time in the Teen Titans may be over, and she needs to go somewhere. Night Force is as good a solution as any. Previously, it has not proven to be a sustainable series, but maybe with a former Titan headlining the title, that may change. Think of a mystical version of the X-Men.